Werribee is a suburb of Melbourne, Victoria, Australia, 32 km south-west of Melbourne's Central Business District, located within the City of Wyndham local government area. Werribee recorded a population of 40,345 at the 2016 Census. Werribee is situated on the Werribee River, approximately halfway between Melbourne and Geelong, on the Princes Highway. It is the administrative centre of the City of Wyndham Local Government Area and is the City's most populous centre. Werribee is part of the Greater Melbourne metropolitan area and is included in the capital's population statistical division. Since the 1990s the suburb has experienced rapid suburban growth into surrounding greenfield land, and becoming a commuter town in the Melbourne-Geelong growth corridor. Due to this urban sprawl Wyndham and its suburbs have merged into the Melbourne conurbation. It was established as an agricultural settlement in the 1850s, originally named Wyndham and was renamed Werribee (derived from the Aboriginal name meaning "backbone" or "spine") in 1904. The suburb is best known for its major tourist attractions, which include the former estate of wealthy pastoralist Thomas Chirnside, known as Werribee Park, the Victoria State Rose Garden, the Werribee Park National Equestrian Centre and the Werribee Open Range Zoo. Early leasing of pastures was led by members of John Batman's Port Phillip Association. A rural township began in the early 1850s. This village was named Wyndham (the name of the local Municipality today). The name derived from a suggestion by the owner of a local village inn, Elliott Armstrong, who sought to honour Scottish soldier Sir Henry Wyndham. The Post Office opened on 12 January 1858 as Wyndham and was renamed Werribee in 1904. However, its adjacent river was called the Werribee River, and the town's name was later changed to Werribee in 1884, and the Shire Council at that time was also renamed Werribee in 1909. Werribee at this time was very popular for development. Thomas Chirnside, a person famous in this area even today, was attracted to the open plain's suitability for agricultural uses. By 1863 he controlled more than 280 square kilometres around Werribee. Chirnside bought other smaller holdings of land at this time. The town grew steadily, helped by a railway line from Melbourne to Geelong, with a station at Werribee in 1857. The Shire was huge, extending from the inner suburbs of Melbourne to Little River to the northward town of Melton and covering 715 square kilometres. Thomas Chirnside committed suicide in 1887. He was found dead in the laundry at Werribee Park with a shotgun lying beside him. His brother Andrew died three years later, and the property was now divided between Andrew's two sons. A new mansion was built, called "The Manor" (not in the same place as the current suburb of Manor Lakes). In 1881 a quarter of the Shire's population lived in the Werribee Township. There were hotels there, as well as recreational venues such as the Werribee Racecourse (built in 1879) as well as the Mechanics' Institute (built in 1883). From 1923 to 1973, Chirnside's property was the site of Corpus Christi College, the seminary of the Catholic Church for Victoria and Tasmania. Werribee's central business district is located along Watton Street; the civic centre (council chambers) being just 500 metres away also makes it the administrative centre of the City of Wyndham. Werribee is surrounded by several mostly residential suburbs: Wyndham Vale to the north-west, Hoppers Crossing and Tarneit to the north, Truganina and Williams Landing to the north-east, and Point Cook to the east. The market gardens and well-known tourist precinct are found in Werribee South, on the other side of the Maltby Bypass. The area's major regional shopping centre, the Pacific Werribee Shopping Centre is actually located just across the suburb boundary in Hoppers Crossing. Werribee's town centre and its Civic Centre (council offices) are located adjacent to the Princes Highway, known locally as Synnot Street. Major local arterial roads Derrimut Road and Old Geelong Road (as an extension of Morris Road) connect the highway to the City of Wyndham's north, as does Cherry Street. Ballan Road is the major arterial to Wyndham's north-west. 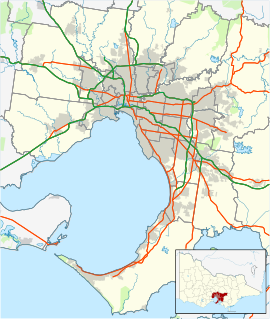 The CBD also links with the Princes Freeway via Duncans Road to the south-east, and via Geelong Road (the continuation of the Princes Highway) to the south west. The Princes Freeway circumvents the township via a section, known as the Maltby Bypass, which opened in June 1961. Werribee, facing the You Yangs to the west. Taken 2017. There are two major railway stations in the area – Werribee railway station and Hoppers Crossing railway station to the north-east, both part of the Melbourne metropolitan network. Werribee Station is the terminus of the Werribee line. V/Line services to and from Geelong ceased in mid 2015 due to the completion of the Regional Fast Rail Project which sees trains diverted out towards Wyndham Vale. A disused station exists on the line near Werribee Racecourse, which at times has had calls to be reopened. Additionally, tracks have been left spread apart for a future station near Derrimut Road. Further suburban stations to the north and west have been constructed on a new line as part of the Regional Rail Link to be joined with the regional rail network. An extensive bus network links Werribee with neighbouring suburbs, with major bus interchanges at Werribee station, Pacific Werribee and Hoppers Crossing station. Wyndham City Council is consistently one of the highest spending councils when it comes to bicycle infrastructure. Thus Werribee is well served with bike paths and bike lanes. The Werribee River Trail – from Davis Creek, Tarneit, connecting with the Federation Trail, and continuing south towards Werribee Park. The City of Wyndham and surrounding areas are serviced by the Werribee Mercy Hospital, which opened in 1994 to replace the now defunct Werribee District Hospital. It is a major provider of mental health care and maternity services for the local area. A new multi disciplinary, purpose-built medical facility was recently built opposite the Mercy Hospital, to be known as Wyndham Private Medical Centre. It includes a general practice clinic, specialist suites, allied health, mental health and pathology services. Aerial perspective of Thomas Chirnside School. Feb 2018. Primary education is provided by numerous public, private and Catholic schools, some of which are combined with secondary education as one P-12 college (denoted c.). Secondary education is provided by a range of public, private and Catholic colleges, also with some being combined with primary education as one P-12 college. Tertiary education is Provided by a number of university and TAFE campuses, which are all located in the Werribee Employment Precinct – a large area between the Princes Highway and Freeway. University of Notre Dame Australia The Melbourne Clinical School is primarily partnered with Mercy Health Care and located adjacent to Werribee Mercy Hospital. The Clinical School is also affiliated with other metropolitan hospitals including Western Health, St Vincent’s Health Care, Calvary Health Care (Bethlehem Hospital) and a variety of local community-based health facilities. ^ Australian Bureau of Statistics (27 June 2017). "Werribee (State Suburb)". 2016 Census QuickStats. Retrieved 21 July 2017. ^ Melbourne Statistical Division Archived 12 May 2013 at the Wayback Machine. (PDF) . vcec.vic.gov.au. ^ Clark, Ian; Heydon, Toby (2011). "Historical Information: Werribee River". VICNAMES. Government of Victoria. Archived from the original on 7 April 2014. Retrieved 24 April 2018 – via Victorian Aboriginal Corporation for Languages. ^ "Corpus Christi College: The Werribee years". Retrieved 1 April 2019. ^ Melbourne, VIC – Map of Melbourne, VIC, 3004 – Melway, Sydway, Brisway, Ausway, Street Smart. Street-directory.com.au. Retrieved on 3 May 2014. ^ "Wyndham History | Maltby Bypass, Princes Highway, Werribee". www.wyndhamhistory.net.au. Retrieved 11 May 2017. ^ New Werribee Station?? / Melbourne suburban / Forums / Railpage. Railpage.com.au. Retrieved on 3 May 2014. ^ Locations – Derrimut Road. Rail Geelong (25 May 2009). Retrieved on 3 May 2014. ^ Retrieved 13 July 2012. Werribeehospitalfoundation.org.au (8 May 2008). Retrieved on 3 May 2014. ^ Retrieved 13 July 2012 Archived 28 July 2014 at the Wayback Machine. Mercy.com.au. Retrieved on 3 May 2014. ^ Welcome to Wyndham Private Medical Centre | Just another WordPress site. Wyndhamprivate.com.au. Retrieved on 3 May 2014.